Regional journalists were honoured at a newspaper publisher’s second annual awards. The Pride of Trinity Mirror Awards, which was hosted by television presenter Carol Vorderman, have been held in Birmingham. Among the winners from the regional press were Neal Keeling, of the Manchester Evening News, who triumphed in the News Journalist of the Year (Regionals) category, and Lee Ryder, from The Chronicle, Newcastle, who won the equivalent award for sports journalism. The Audience Engagement award was shared between the Liverpool Echo’s Ben Turner, for his work on the website’s daily liveblog, and Beth Ashton, of the Manchester Evening News, for her coverage of the Manchester Dogs’ Home tragedy. Front Page of the Year went to The Chronicle for its ‘Read This, Mr Ashley’ headline, printed after its journalists were banned from Newcastle United Football Club by owner Mike Ashley. Another football-related winner came in the Campaign of the Year category, for the Coventry Telegraph’s #BringCityHome scheme, which successfully saw Coventry City return to playing home games within the city. 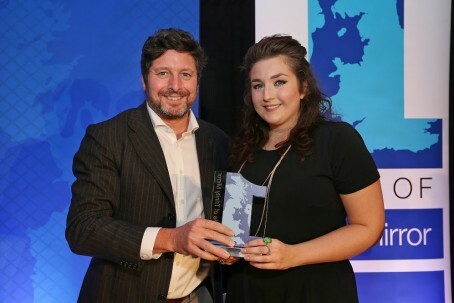 Scoop of the Year was awarded to Harriet Robinson, of the Hinckley Times, pictured above with Trinity Mirror group editor-in-chief Lloyd Embley, for her reporting of a child abuse scandal at a local theatre. Trinity Mirror chief executive Simon Fox said: “It was another fantastic evening and a fitting way to celebrate the journalistic excellence we have at Trinity Mirror. “What struck me – and the rest of the judging panel – was the breadth of talent on display across the hundreds of entries we received. Congratulations Harriet! Well deserved, truly a great scoop.